The injured, unable to descend 10,062-foot Mount Ontake on their own, are staying in mountain lodges. TOKYO — A volcano in central Japan erupted in spectacular fashion on Saturday, catching mountain climbers by surprise and stranding at least 40 injured people in areas that rescue workers have been unable to reach. Another seven people were missing. The injured, unable to descend 10,062-foot Mount Ontake on their own, are staying in mountain lodges, said Sohei Hanamura, a crisis management official in Nagano prefecture. Thirty-two people had serious injuries, including at least seven who lost consciousness. Police, fire and military rescue workers were planning to try to reach the area on foot after daybreak Sunday, after deciding that the ash in the air made it too dangerous to use helicopters. Hanamura said seven people were reported missing on the mountain. Lodge managers are familiar with first aid procedures and were communicating with rescue officials in town, he said. With a sound likened to thunder, the volcano erupted shortly before noon on a clear autumn day, spewing large white plumes of gas and ash high into the sky and blanketing the surrounding area in ash. Smaller eruptions continued into the night. About 250 people were initially trapped on the slopes, but most had made their way down by Saturday night, Japanese public broadcaster NHK reported. Some were in shelters set up in four nearby towns. One witness told NHK that the eruption started with large booms that sounded like thunder. In a video posted on YouTube, shocked climbers can be seen moving quickly away from the peak as an expanding plume of ash emerges above and then engulfs them. Many of those who made it down emerged with clothes and backpacks covered in ash. They reported being engulfed in total darkness for several minutes. Mikio Oguro, an NHK journalist who was on the slope on an unrelated assignment, told the station that he saw massive smoke coming out of the crater, blocking sunlight and reducing visibility to zero. “Massive ash suddenly fell and the entire area was totally covered with ash,” he said by phone. He and his crew had to use headlamps to find a lodge. “My colleagues later told me that they thought they might die,” Oguro said. Two Jetstar flights headed to Tokyo’s Narita International Airport diverted to Kansai International Airport in western Japan as a precaution. 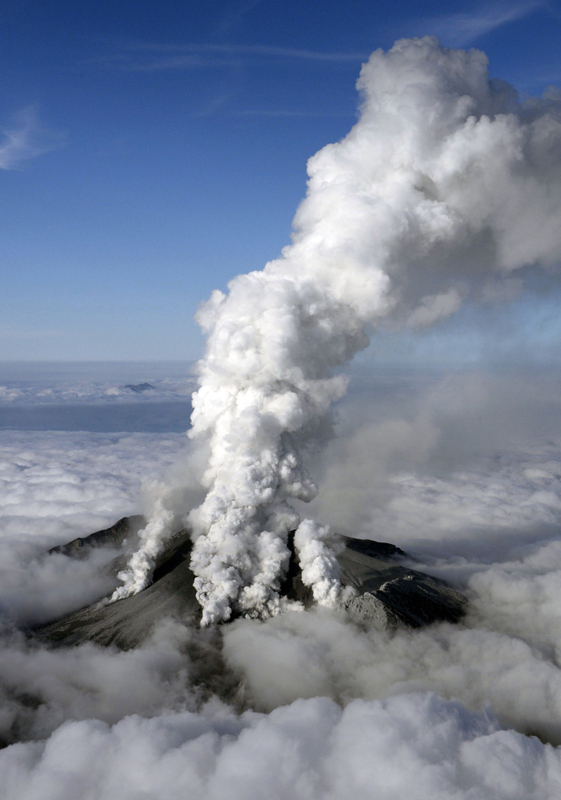 Japan’s meteorological agency raised the alert level for Mount Ontake to 3 on a scale of 1 to 5. It warned people to stay away from the mountain, saying ash and other debris could fall up to 2.5 miles away. Mount Ontake, about130 miles west of Tokyo, sits on the border of Nagano and Gifu prefectures, on the main Japanese island of Honshu. The volcano’s last major eruption was in 1979.